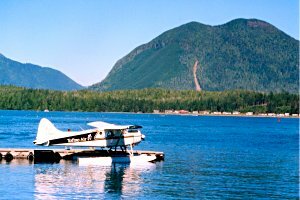 Located on Vancouver Island, British Columbia, to the north and west of Victoria 316 km on highways 1, 19 and 4, Tofino offers both onshore and offshore fisheries. Home to BC's well-known Long Beach, Tofino hosts visitors each spring for grey whale migration cruises. The Wickaninnish Inn and Pointe Restaurant near Chesterman Beach are considered among the finest accommodation and cuisine offered in pristine wilderness in the world. Also an area of aboriginal and logging activism, Meares Island north of Tofino in Clayoquot Sound has become a catalyst for environmentally sensitive logging practices in the largest temperate rainforests in the world. Winter fishing is influenced by open Pacific storms that limit access to the fishing grounds. On rare days when weather is not a factor, abundant 7 - 15 lb winter springs make for brisk fishing. Summer fishing is influenced by improved weather and, more recently, El Nino induced change in baitfish species; long an area of needlefish and herring populations, pilchard are increasing in numbers. Although shaped like anchovy, pilchards are larger, like herring, and thus make extremely fishy cutplugs. The most significant development in recent summers is the coho fly fishery developed by the Weigh West Resort . Fishery hotspots have been determined, flies developed and tested, special casting boats designed and the world fly fishing tournament envisioned. Fly fishers from abroad will be keen to know that more and more coastal resorts are developing the potential of fly fishing for many of the over 50 species of Pacific gamefish, including: chinook, pink and sockeye salmon, lingcod , black bass, mackerel, and the 12 species of rockfish. Although all five species of salmon may be found in Tofino waters, two species predominate: coho and chinook. Both are present most of the year as either resident winter feeders or bluebacks and as mature summer fish migrating to spawning beds. Sockeye and pink normally migrate great distances offshore and are not commonly encountered. A few chum navigate to local rivers in late October. Winter chinook inhabit local waters from October - March, reaching weights of 15 lbs. One to two pound blueback coho school in January to March. When weather permits, halibut fishing on the offshore banks proves successful 12 months of the year, with June - August being the prime period. Halibut move onto gradual dropoffs in the continental shelf 3 - 4 miles off Portland and Rafael Points. 20 - 40 lb chickens form the basis of the fishery, with fish to 200 lbs also taken. Summer fishing begins in April with early chinook bound for the Fraser and Columbia Rivers. Weights average 17 - 28 lbs. The bulk of the summer fish are chinook from Robertson Creek, Conuma hatchery, Nitinat River and Clayoquot Sound's Kennedy River. These fish average 25 lbs. When encountered, Sockeye peak in August. 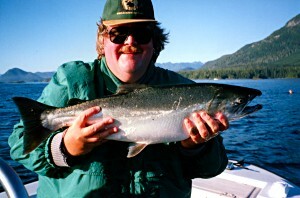 Coho arrive early in Tofino, with good schools encountered as ravenous 5 pounders in June. These commonly feed so heavily they grow a pound per week and by September reach the 12 - 15 lb range. Northern numbers strengthen in August and continue building through September. The Meglin River and Tofino hatchery support good populations of coho. Local chum may be seen spurting from the water in October. Bait: Anchovy or medium herring on 36 - 72" leaders for chinook. Cutplugging reaches a peak in August. For halibut, utilize a spreaderbar with a Spinnow instead of a weight. Hootchies: Utilize a 40" leader behind a Hotspot flasher for both squirts and hootchies. Patterns include Army Truck, tractor back (a chartreuse squirt) and the locally- named 'Tofino Dog Turd' 6" brown squid. Plugs: As with other Pacific Ocean shores, the 602 is favoured, however, in contrast to to other areas, 3 - 5" models predominate. Spoons: For summer chinook and coho, Coyote spoons in green and white and green and glow prove deadly. Other spoons include the Glendon Stewart, Gibbs Gator in mud pie and green and silver, as well as Krippled Ks in green and chrome and the frog pattern. Bucktails: Early in the season, pink bucktails take the most fish then give way to the Coronation, and Grey Ghost. The latter proves lethal on coho later in the summer. Drift Fishing: Magic Lures in green and white for both chinook and halibut. Other favoured drift lures include: Point Wilson Darts, Dungeness Stingers and Gibbs Minnows. Fly Fishing: Recently developed flies include: Catfaced Streamer, Weigh Wester, Pearl Mickey and Clouser Minnow. 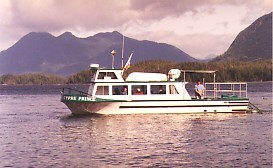 Tofino has two types of fisheries: structure-related fishing for chinook salmon and halibut; and, summer surface fishing for other salmon species. In addition, three distinct fishing opportunities present themselves: offshore bank fisheries; onshore surfline fisheries; and, protected inside waters in Clayoquot sound. 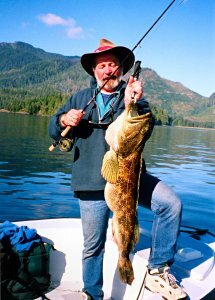 As with other remote areas (although often unmentioned) lingcod and red snapper abound. In the Tofino area, the continental shelf drops off gradually from land to 600' and fish tend to swim along the shelf lines or inhabit the various rock piles 1 � - 10 miles out in the Pacific Ocean. It is not uncommon off Portland Point or Rafael Point to receive double headers of halibut and chinook at the same time. La Parouse is the local bank with the Southwest Corner a consistent spot. The surfline fisheries, also not for the faint of heart, occur right on rocky points where the swell rises and piles into the shore at Wilf Rock, Blunden Island, Bartlett Island and other spots. July to September is the prime chinook period with coho fishing extending from May into November in some years. The inside waters of Clayoquot Sound present safe year round fisheries for the seasick-challenged among us. Local rivers such as the Bedwell, Meglin, Moyeha, Clayoquot as well as Tranquil Creek all contribute chinook. Note that spot closures apply.